The blog has gone to the dogs, well maybe just this post for now. 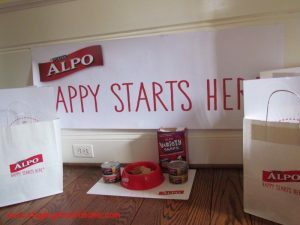 Thanks to ALPO for supplying us with a fun party pack to get our #HappyStartsHere dog party ideas in motion. All the opinions expressed are 100% my own. While we love having people parties around here, Chloe decided it was time to entertain some friends for a dog food testing, even if it was not her dog birthday party. The fun part was getting the adults to start thinking dog! 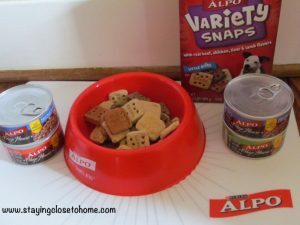 ALPO’s new campaign, #HappyStartsHere is all about “If dogs could talk, what would they say?” ALPO was so gracious in their party box they sent, filled with plenty of wet dog food and tasty ALPO Snaps Snacks. Look at this great assortment we received in the mail. 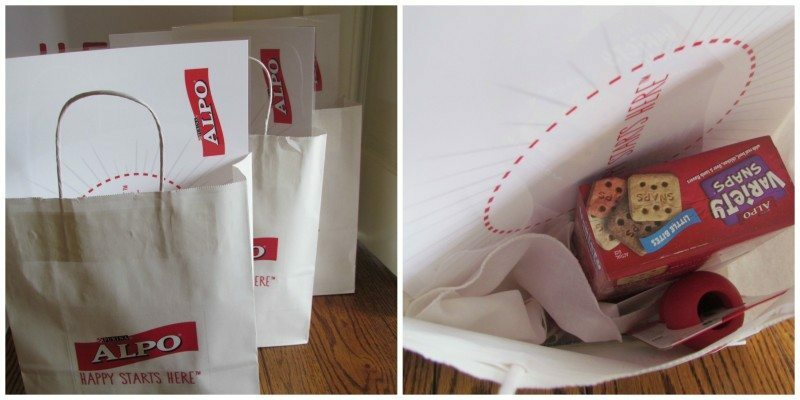 We set up the party bags and filled them with ALPO free product coupons, ALPO dog Treats, and a KONG to name a few. There would be plenty of sampling going on at this party. 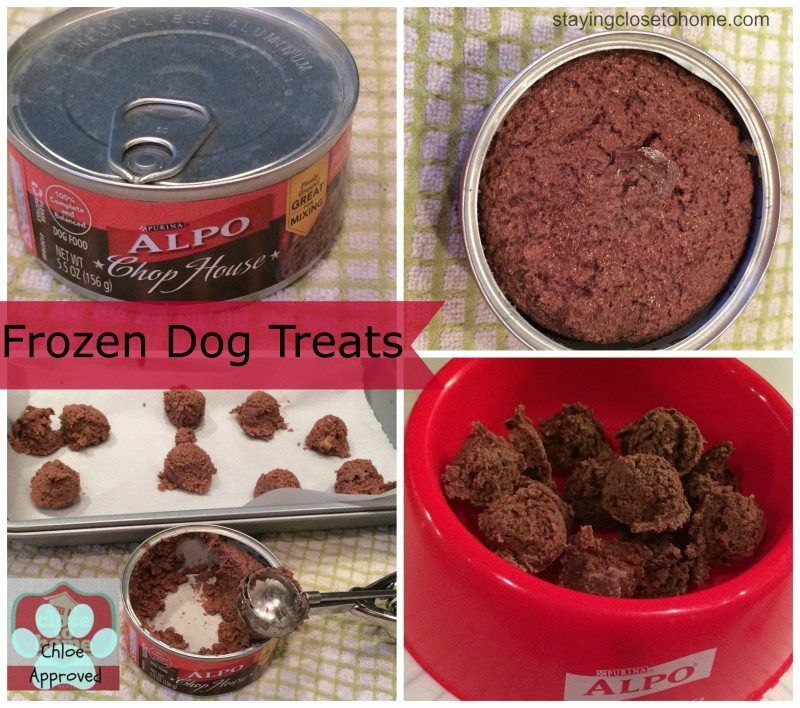 Since these dogs do not eat wet food I decided to convert a few of the wet dog food cans into frozen dog treats. So simple and they get the right ingredients just in smaller bite size portions. Simply scoop out food with a small ice cream scoop and freeze for a few hours. Store them in a Ziploc bag. A bowl full of dog goodness. Now for the people fun. Each owner was given the task to “speak for their dog”. Each owner had to fill out their talk bubble with what would their dog say when tempted with an ALPO Snap treat. 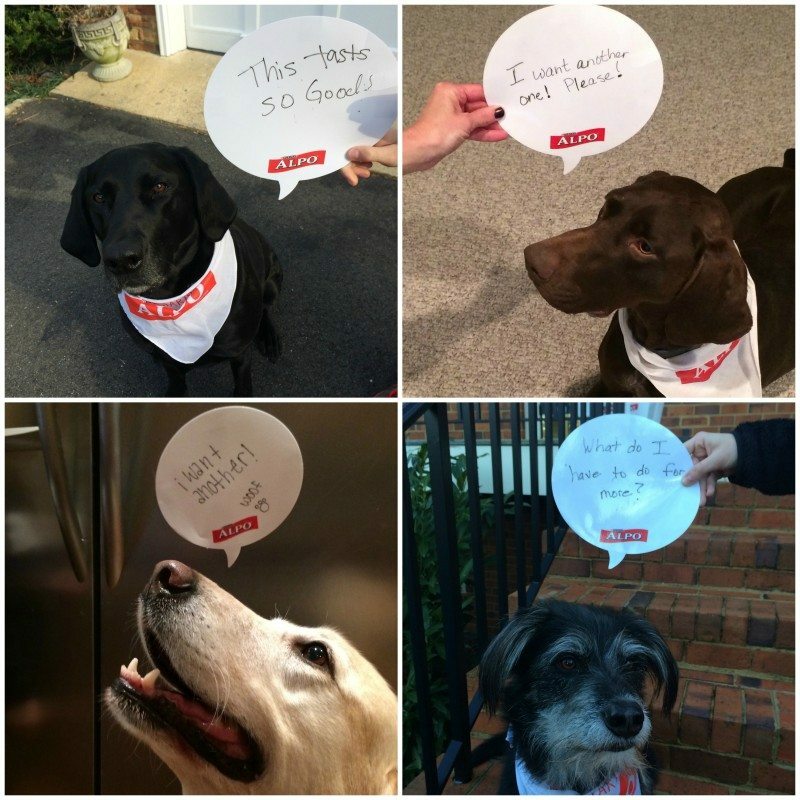 Here are a few of the doggie responses. A few more, everyone looks happy to participate. Of course Chloe is showing off her best training while she anxiously waits for her command to take a taste. What do you think she is saying here? Where does your Happy start? Ever thought what would my dog say right now? Have yourself a #HappyStartsHere dog party and have some doggy fun! What other dog party ideas do you have? Oh I think they would love the CHOP HOUSE ORIGINALS® ROASTED CHICKEN FLAVOR COOKED IN SAVORY JUICES! They really love chicken! My dogs are very picky eaters. They love all of the Alpo Chophouse varieties, especially the Roasted Chicken. Sissy would like the tender bites with lamb. I think my dogs would love the filet mignon but would probably devour any of them really. Our dogs love the Chop House Original Filet Mignon Flavor with Angus Beef! Schooner and Skipper would LOVE to try the CHOP HOUSE ORIGINALS® FILET MIGNON FLAVOR! Because it sounds sooooo YUMMY! My dog likes the roasted chicken flavor. My dog would love the CHOP HOUSE® BEEF TENDERLOIN FLAVOR IN GOURMET GRAVY. She doesn’t like the ground food. Our dog, Sky, would love all these flavors, but I think she would really love the CHOP HOUSE® BEEF TENDERLOIN FLAVOR In Gourmet Gravy.
. my 3 girls would love all of the flavors however, i think the filet mignon sounds great. My dog loves turkey bacon! My aunt’s dog would love any of the flavors I’m sure. She’s a Lab and they like everything! my dog loves chophouse!and anything with a great flavor! Griffin would love turkey and bacon! My dog likes the Chop House Originals Filet Mignon flavor. The TBone Steak flavor is the one that I think my boys would like. I think my Pomeranian would like the filet mignon food! oops…forgot to mention that I think the TBone Steak flavor would be a favorite of dogs. OMGoodness…this is sooooo cute. I loved seeing all the pictures of the happy lil’ dogs…too freakin’ cute. Your pooch is adorable, and I love the restraint she shows when she has the treat on her paw. I taught my dog to ‘leave’ treats alone…it was so cute, I’d say ‘leave it’ and he’d turn his head away like it wasn’t even there…kinda like ‘out of sight, out of mind.’ It was the cutest thing. Looks like a very fun event for the pooches. My dog loves the beef! She isn’t too picky, but I prefer to give her the sirloin flavor. My two are not picky, but they do love chicken so I gotta say the roasted chicken flavor. Shiloh would eat any of them, but I think he’d like the roasted chicken the best. My dogs love ALL t flavors,but I’d have to say they like the Filet Mignon flavor the best. Looks like some happy Doggies! No Dogs here but will be sharing! I think Turkey and Bacon will go over well. I dog really enjoys the Top Sirloin flavor wet dog food. HOMESTYLE ROAST BEEF FLAVOR IN GRAVY the very best! My Dogs Love Alpo! Their Favorite Is The CHOP HOUSE Originals® TOP SIRLOIN FLAVOR Cooked in Savory Juices! 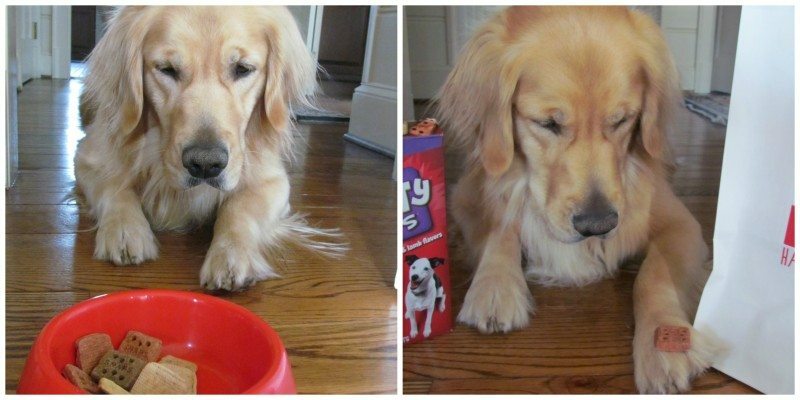 My dog Buddy isn’t picky at all – he’ll take any of the flavors, as long as it Alpo!